On January 22 and 23, 2015, U.S. and Cuban diplomats met in Havana to discuss a multitude of issues relating to the restoration of normal diplomatic relations. No agreements were reached other than an understanding that additional talks were necessary and would be held albeit without dates or location being set. The first topic focused on technical issues related to reestablishing diplomatic ties. Gustavo Machin, the Cuban foreign ministry’s deputy director for U.S. affairs, said, “We have spoken about the principles upon which our diplomatic relations should be re-established.” The participants were “very respectful and flexible,” and not all the outstanding issues would be resolved in the first meeting. Officials for both countries, however, outlined issues standing in the way of a normal U.S.-Cuba relationship. Ms. Jacobson spoke of the U.S.’s persistent concerns about Cuban human rights while Cuba’s representatives talked about their concern for U.S. human rights, especially recent police killings of unarmed black men in Ferguson, Missouri and New York City and the treatment of detainees at the U.S. base in Guantanamo Bay Cuba. An unnecessary note of discord was introduced by a problem over the U.S. translation into Spanish of the Jacobson’s English-language post-session written statement. The statement (with the English word in question put in bold) said, “As a central element of our policy, we pressed the Cuban government for improved human rights conditions, including freedom of expression and assembly.” The U.S. translation of this statement used the Spanish verb “presionar,” which means to pressure. 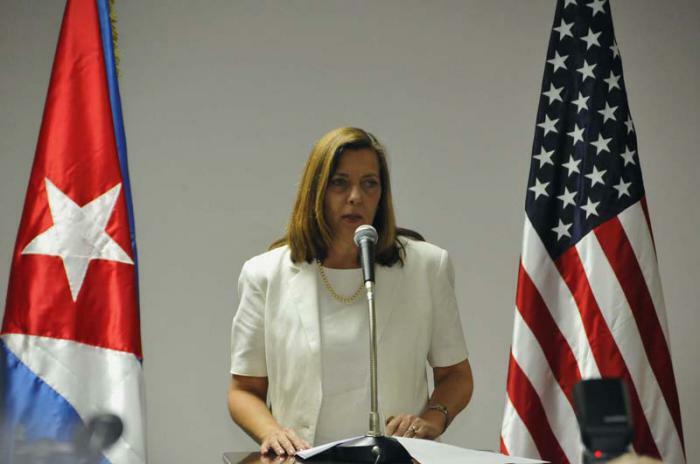 Josefina Vidal, the head of the Cuban delegation, however, said, “I can confirm that the word ‘pressure’ was not used. I must say it’s not a word that is used in these types of conversations.” Later the U.S. apologized for its erroneous translation. Both of the countries’ leaders talked about the need for further discussions and negotiations to resolve these many issues. I expect the two sides to develop an agenda and plan for addressing these many issues, including dates and location for the next set of talks. In a subsequent post I will set forth my views, as an outsider, as to how these differences can be resolved. This post is based upon the following: Wroughton & Trotta, U.S. says mistrust must be overcome to restore Cuba Ties, Reuters (Jan. 22, 2015); Archibold, Conflict, and Smiles, as U.S. and Cuba Discuss Ties, N.Y. Times (Jan. 22, 2015); Reuters, U.S. Presses Cuba on Human Rights in Talks on Restoring Ties, N. Y. Times (Jan. 22, 2015); Sosa, U.S. aims to go beyond the restoration of relations with Cuba, Granma (Jan. 22, 2015); DeYoung, U.S., Cuba find ‘profound differences in first round of talks, Wash. Post. (Jan. 22, 2015); Klapper & Weissenstine, U.S., Cuba End Historic talks with More Questions than Answers, Assoc. Press (Jan. 23, 2015); Respectful and constructive climate brand rapprochement between Cuba and the United States, Granma (Jan. 23, 2015); U.S. is willing to discuss their differences with Cuba, Granma (Jan. 23, 2015); Ayuso, US and Cuba confirm a channel for dialogue despite their differences, El Pais (Jan. 23, 2015); Ayuso, The dialogue between Cuban and the US stumbles on human rights, El Pais (Jan. 23, 2015); An exchange that made world headlines, Granma (Jan. 23, 2015); Jacobson, Video of Statement on U.S.-Cuba Meetings (Jan. 23, 2015); Assoc. Press, U.S., Cuba End Historic Talks With More Questions than Answers, N. Y. Times (Jan. 23, 2015); Assoc. Press, U.S. admits: we’re not sure if new Cuba approach will work, Guardian (Jan. 23, 2015). Reuters, U.S. Presses Cuba on Human Rights in Talks on Restoring Ties, N. Y. Times (Jan. 22, 2015), http://www.nytimes.com/reuters/2015/01/22/us/politics/22reuters-cuba-usa.html?_r=0; Sosa, U.S. aims to go beyond the restoration of relations with Cuba, Granma (Jan. 22, 2015), http://www.granma.cu/mundo/2015-01-22/eeuu-aspira-a-ir-mas-alla-del-restablecimiento-de-relaciones-con-cuba; DeYoung, U.S., Cuba find ‘profound differences in first round of talks, Wash. Post. (Jan. 22, 2015), http://www.washingtonpost.com/world/the_americas/us-cuba-begin-talks-aimed-at-ending-decades-long-estrangement/2015/01/22/cda610b6-a1ba-11e4-91fc-7dff95a14458_story.html?hpid=z1; Klapper & Weissenstine, U.S., Cuba End Historic talks with More Questions than Answers, Assoc. 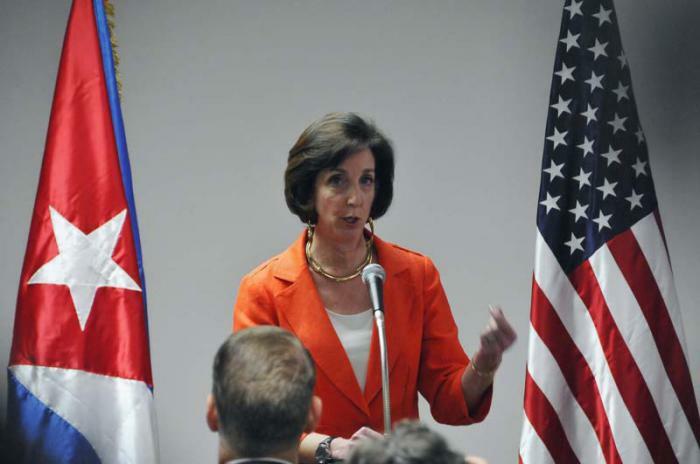 Press (Jan. 23, 2015), http://hosted.ap.org/dynamic/stories/L/LT_UNITED_STATES_CUBA?SITE=AP&SECTION=HOME&TEMPLATE=DEFAULT; Respectful and constructive climate brand rapprochement between Cuba and the United States, Granma (Jan. 23, 2015), http://www.granma.cu/mundo/2015-01-23/clima-respetuoso-y-constructivo-marca-acercamiento-entre-cuba-y-estados-unidos; U.S. is willing to discuss their differences with Cuba, Granma (Jan. 23, 2015), http://www.granma.cu/mundo/2015-01-23/eeuu-esta-dispuesto-a-discutir-sus-discrepancias-con-cuba; Ayuso, US and Cuba confirm a channel for dialogue despite their differences, El Pais (Jan. 23, 2015), http://internacional.elpais.com/internacional/2015/01/23/actualidad/1422029081_706421.html; Ayuso, The dialogue between Cuban and the US stumbles on Human rights, El Pais (Jan. 23, 2015), http://internacional.elpais.com/internacional/2015/01/23/actualidad/1421979307_164657.htmlhttp://internacional.elpais.com/internacional/2015/01/23/actualidad/1421979307_164657.html; An exchange that made world headlines, Granma (Jan. 23, 2015), http://www.granma.cu/cuba/2015-01-23/un-intercambio-que-ocupo-los-titulares-del-mundo; Jacobson, Video of Statement on U.S.-Cuba Meetings (Jan. 23, 2015), http://www.nytimes.com/video/multimedia/100000003468209/explosions-in-yemeni-capital-after-hadi-resignation.html?playlistId=1194811622186; Assoc. Press, U.S., Cuba End Historic Talks With More Questions than Answers, N. Y. times (Jan. 23, 2015), http://www.nytimes.com/aponline/2015/01/23/world/americas/ap-lt-united-states-cuba.html.